Hi, everyone! 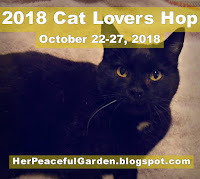 This is the third post of my blog blast of cat-themed projects for the Cat Lovers Hop! A special thank you to Janis at Her Peaceful Garden for hosting this wonderful event to celebrate our love of kitties! 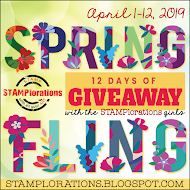 The hop runs until tomorrow so there is still time for you to join in the fun! I'm excited to be joining this hop for the fourth year! For an update on my husband's health, please see my first post here. The cat image was fussy-cut from a recycled greeting card. Behind the kitty are some layered doilies from my stash. 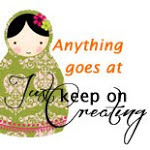 The thought bubble and sentiment are from MFT Stamps (Cattitude and I Knead You). 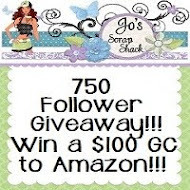 The heart die-cuts are from MFT Die-namics Heart Border Staggered. 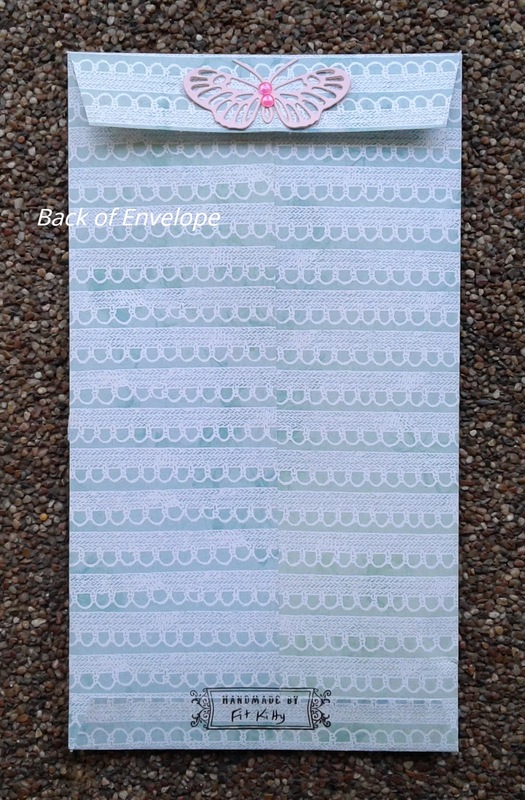 I used a 12x12" sheet of patterned paper from my stash to create the envelope. I watched a few video tutorials on YouTube but made my own custom-size envelope to fit the items that went inside. In this case, it held a pocket letter. Here's the back. I added a butterfly die-cut with some gems at the top. The handmade stamp was received in friend mail. 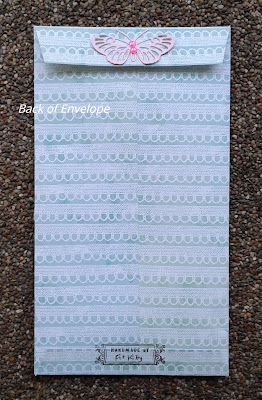 The envelope is held closed with a velcro half-circle so it is reusable. I love how you recycle greeting cards! I have a stack of some I intend to recycle, but haven't yet. Hope they turn out as pretty as yours! I love how you upcycle. 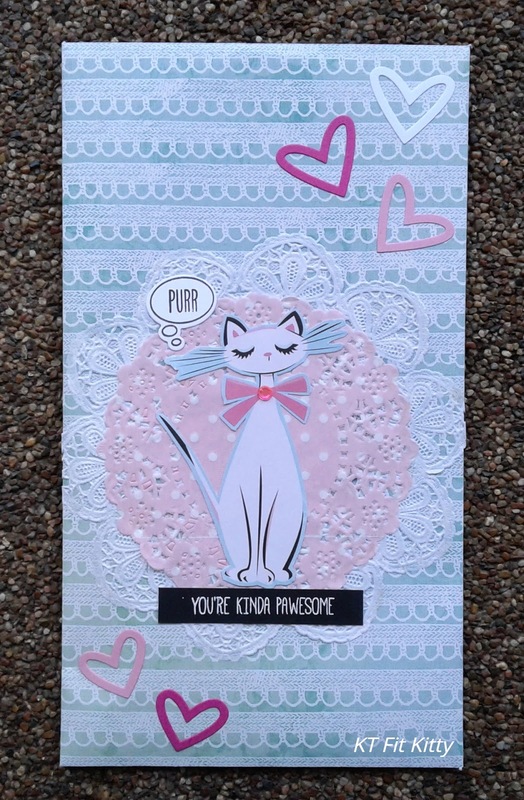 The lacy layers are perfect for the pretty kitty. She is so purr-ty! Another feminine make and I love that. Precious white cat, looking so elegant and regal, Kitty! Love the hearts. This card is adorable. The kitty is really elegant. Great choice of colors!!! 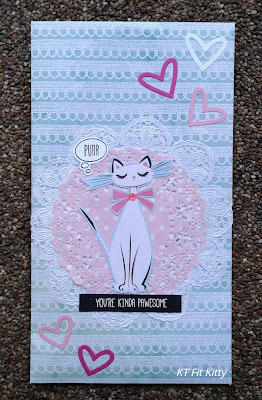 This one is very feminine and sweet, love that gorgeous cat-lady and the fax lace on the paper! The doily adds more sweetness, as well the cute butterfly on the back!!! Isnt this kitty just a princess! Very regal and pretty! Love your envelope! Oh how adorable! 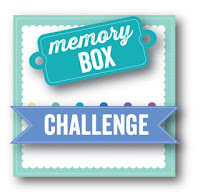 Thanks so much for joining in the fun at our Double D ‘Stripes & Dots’ challenge! Good Luck and we hope you’ll come back often. Oh, I think I need to start using some of my cat themed supplies to make pretty envelopes like these. They would make wonderful little favor bags for cat-loving friends anytime. Those hearts are a wonderful embellishment with the cat image on the envelope. Your card and matching envelope are 'paw'some lol I like your dotty stripe patterns, super cute. That kitty is sweet and perfect heart accents! 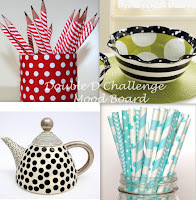 Thanks so much for playing along with us at The Double D Challenge Blog, Stripes And Dots, Donna, DT Member. 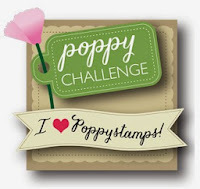 Thank you for sharing with us over here at Penny’s Paper-Crafty Challenge blog and best of luck with your entry. So pretty. I like the lacey look and the hearts. Love your envelope! It's so purr-ty! 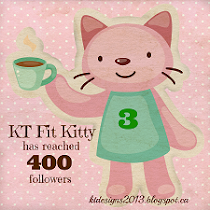 This turned out fabulous, like the frilly design abd darling cat! PS Watch your P.O. box for something headed your way. Hugs. Love this goodie envelope. 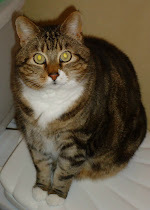 That lovely kitty reminds me of a retro 60s-style cat. Beautiful with the layered doilies and hearts...and butterfly on back!